Fun Designs for the Birthday Girl ! This original shirt design was made for one of my favorite clients...who lets me freely experiment with fabric and design. His only requests? 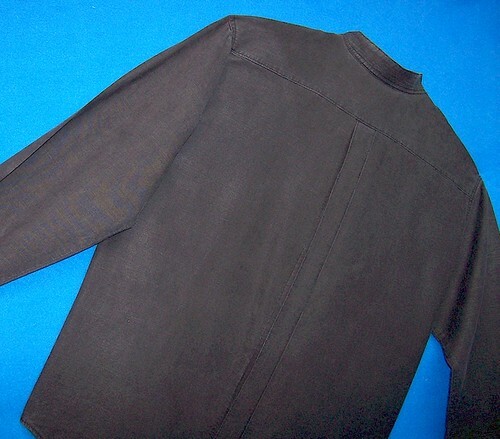 "No pointed collar, black fabric, and make it look sort of rough." 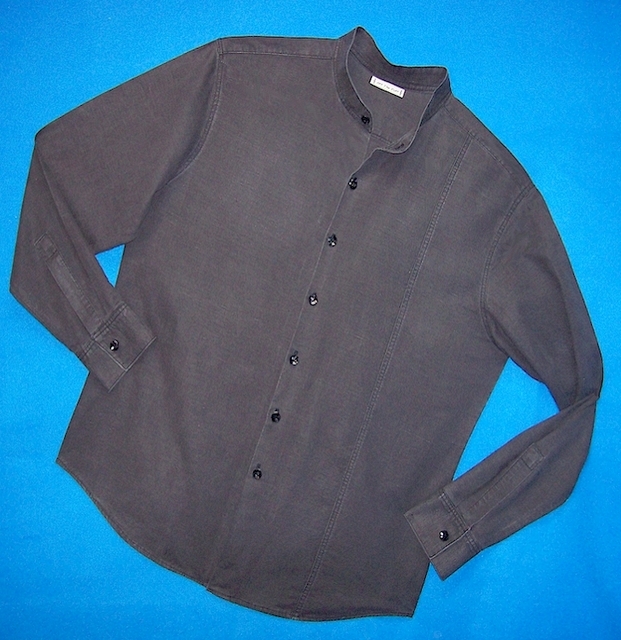 A supremely comfortable band collar shirt with a "Prince Seam"
made from a Medium-weight silk/hemp blend fabric. Making it "rough" was fun! Usually I distress fabric before I cut and sew. This time I pre-washed the fabric very gently...just to get some of the "shrink" out of it. Then I took it out of the dryer and merely smoothed out the fabric...leaving some fine wrinkles....and cut and sewed the shirt. After it was complete, I tossed it into the washer along with several (clean) tennis balls, and ran it through 10 (yes ten!) cycles. Don't worry. I didn't waste water, I just kept re-setting the cycle. After a long tumble in the dryer (set on hot), the shirt was gloriously soft, the flat-fell seams nicely puckered and "worn looking", and the fabric slightly faded. Here is the back view....showing the edge-stitched box pleat. The best part? My client is thrilled with his new shirt...and that's what it's all about! Sewing Notes: Hand-drafted Original Design, Buttons and Pro-Woven Shirt-crisp Fusible Interfacing from ~Fashion Sewing Supply~, Fabric from Hemp Traders. WOW!!!! Now THAT's the way a men's casual shirt is done. Brava! Cool indeed. Love the look of it. Pam, that's a great shirt! Impressive! I wouldn't mind one like that myself! Silk and hemp, huh? Wow! Great shirt Pam! I like the worn look and prince seam. Great shirt. Hooray for the man who likes to be stylish and doesn't mind experimentation. Wow, that is one great shirt. Very impressive job, as always. WOW!! What a COOL idea!!! The shirt looks very nice!! I'll bet your customer was more than satisfied with the end result!! Very cool. My husband would like this! Another beautiful shirt! Your work is fabulous! I agree, one cool shirt. I was wondering how you got those seams to look whitish. You are so creative. I would be thrilled too. What a beautiful shirt. Great work Pam. Pam, it's really a good-looking shirt and I can see what the client was so pleased. I've never tried anything like the tennis ball technique, but we have a house full of the things though the dog will probably be more distressed than the fabric. I also love that you tell us which of your interfacings you use. Thanks! I love this shirt. the color and shape are fantastic and I especially love the neck MAO. What a beauty! I love the way you distressed the fabric - I may have to try that one of these days. You always manage to turn out a new shirt just as I think I don't want to make another one any time soon, and then you re-inspire me. Spectacular shirt! I love the 'rough look' of this shirt. I love this shirt but I'm not familiar with the term "prince seam" Can you explain? KATZBER...a "Prince Seam" is my name for a "princess seam" on a man's shirt. On most shirts when I use a "prince seam", it is usually a straight seam placed midway down the right front of the shirt. It serves no other purpose than to be a "decorative detail".